Before LoveBug was born, my husband and I did hours of research on the Internet to find the very best cloth diapers at the very best prices. I read a gazillion reviews on message boards and blogs before settling on Green Acre Design (GAD) pocket diapers. I was convinced that we could have nothing else, as these would be the perfect diaper. 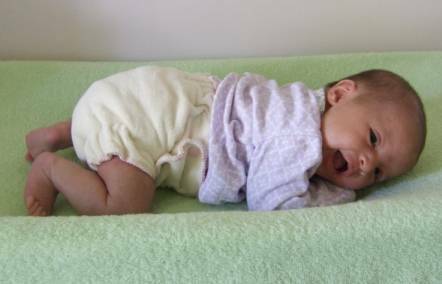 When LoveBug was born, I realized two things: 1) though the GAD diapers were exceedingly cute, they didn’t fit her as well as other brands, and 2) my daughter was too small for cloth diapers in general. We ended up using disposables that we’d been given until she was big enough to use our cloth diapers. It ended up being a convenient thing, since meconium (after a baby swallows amniotic fluid, she will expel it in a black, tarry form referred to as “meconium”) is tricky to get out of anything that it touches (much easier to throw the stuff out!) and I didn’t want anything rubbing against her umbilical cord or unhealed belly button. If you wish to cloth diaper right away, there are a few options out there that might fit your baby: pre-folds (you can find them in small sizes, but they will still be very bulky on your baby! 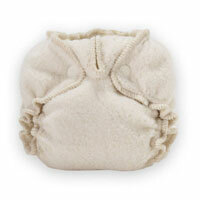 ), one-sized diapers (such as the bumGenius! one-sized diaper that I will be posting a review on momentarily), or Kissaluvs Size 0 diapers. If your baby is over 8 lbs, you may also be in luck to try a variety of sized “small” cloth diapers in different brands. I personally haven’t used a Kissaluv diaper, but they remain the most popular diaper for newborns according to my Internet readings. They claim to fit a baby from 5-15lbs (that can be a long time in baby-world) and come as either a fitted our contour diaper in a variety of colors. It’s up to you if you want to always use a waterproof cover for them since newborns don’t pee or poop enough (and it’s runny anyway, especially for breast fed babies) at one time to completely saturate a diaper. I’ve read that this brand of diapers is especially good for dealing with the umbilical cord since it gives it room by making a scoop type dip in the front of the diaper (fitteds). If you’re interested in trying a Kissaluvs, you can either buy them in a store or online, or if you’re interested in trying a “bundle,” you can purchase right from the Kissaluvs website! The diaper bundles range in price from $25.00 for a contour diaper, fitted diaper, and wipes to $99.00 for 6 diapers, 3 doublers, wipes, diaper lotion spray, and a diaper wrap. They make diapers in sizes up to 40 lbs, too, so you can still try them even if you don’t have a newborn any more. 🙂 Another cool thing is that Kissaluvs is offering to send two free premium designer wipes to any of my readers who purchase a bundle from them. All you need to do is enter the code “simplyblog” in the discount/code section when you checkout. When did you start using cloth diapers on your new baby? What brands have you used and what to you like or dislike?